The LEDP10W-240E-70 LED Light Bar with 70 foot cord is ideal for a wide variety of uses including equipment, vehicle, military, law enforcement and industrial manufacturing applications. 20,640 lumen light output with low voltage and amp draw, a 50,000 hour rated service life and 9 to 46 volt compatibility provides operators with a versatile and powerful LED lighting solution. The LEDP10W-240E-70 LED light bar from Larson Electronics produces 20,640 lumens of bright light while drawing only 240 watts @20 amps from a 12 volt electrical system. Twenty four CREE XLamp MC-E®10 watt LEDs producing 860 lumens each are paired with high purity optics to produce a 20 degree spread spot beam approximately 1450’ long by 200’ in width. We also offer floodlight versions with a 40 degree beam spread to provide more light over a larger area nearer the fixture, making flood versions ideal for use as work lights. These LED light bars are waterproof to 3 meters, sealed against intrusion by dust and dirt and very ruggedly constructed to withstand the most demanding environments, conditions and applications. 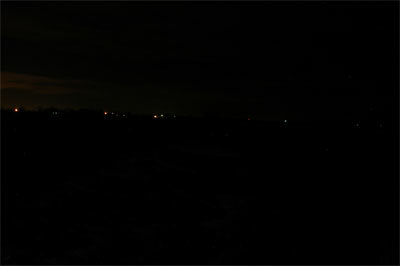 This shows the LEDP10W-240E-70 illuminating the field in flood configuration. This unit is ideal for work area illumination where more light is needed closer to the fixture.. This is a close up of the `Larson Electronics` sign. The output gets soft past the sign due to it`s flood configuration, yet the flood beam is still powerful up to 800`.